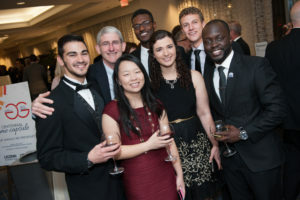 The University of Connecticut’s School of Engineering celebrated its centennial with the Gadget Guru’s Gala on Nov. 11. With over 350 people in attendance, speakers reflected on the impressive impact UConn Engineering has had over the past 100 years. Governor Dannel Malloy emphasized the importance of engineering to the state of Connecticut. “Those of you who are associated with this university, if you’re associated because you’re an employer, you get to employ some unbelievable graduates,” said Malloy. 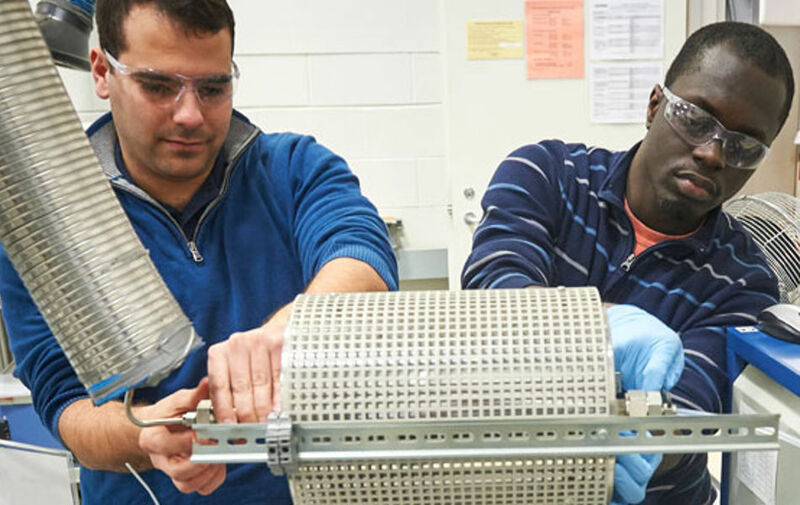 “If you’re Pratt and Whitney or United Technologies or Sikorsky or GE or Electric Boat or a supplier to those companies you understand how great this university is and you understand what’s happening at the engineering school. “There is no limitation to how great this school can be,” he said. Michael Cantor, co-managing partner of Cantor Colburn, and J. Michael McQuade, senior vice president of science and technology for United Technologies, echoed Malloy’s sentiment. “As Co-Chairmen of the Engineering Centennial, Michael McQuade and I want to thank everyone who has made this school our treasure. Many of us could not run our businesses without the outstanding men and women engineers educated here at UConn,” Cantor said. Cantor said that 66 new scholarships had been created this year. 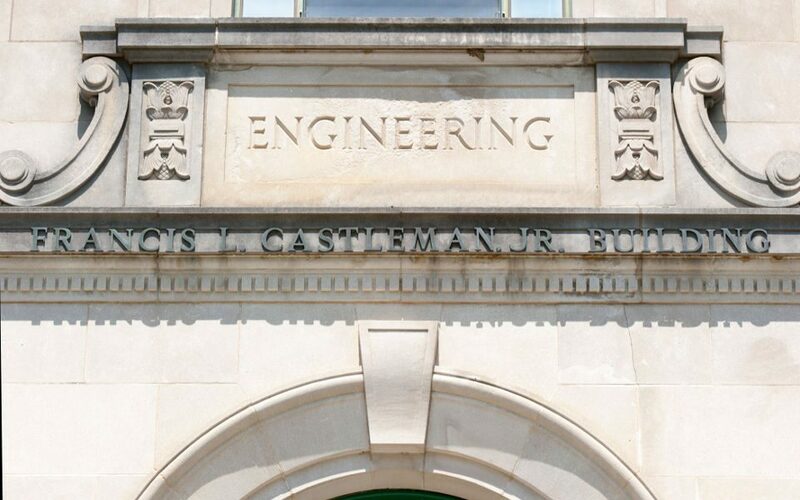 The Engineering Centennial began with a goal of creating 100 new engineering scholarships. 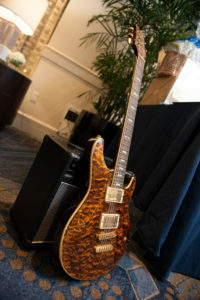 Cantor acknowledged the impressive progress and encouraged attendees to donate a scholarship to help meet the initial goal. Cantor also emphasized how strong UConn Engineering has become. “Never before have we been so excited about the quality and number of students and the far reaching impact of the research done by the faculty, students and industry partners, all of which we’ve done together,” He said. UConn President Susan Herbst emphasized the impressive growth that UConn Engineering has seen since 1916, when the first four year program in engineering at UConn was offered. “When the first bachelor’s degrees in engineering were offered in Storrs a century ago, an event like this was not to be imagined. UConn wasn’t even a full fledged university yet. In 1916 there were just two faculty members dedicated to engineering education,” Herbst said. Herbst then discussed where engineering is now, with 161 full time faculty, over 3,300 undergraduates and around 900 graduate students. There are eight applicants for each new undergraduate slot in the school. UConn Provost Mun Choi further emphasized the impressive expansion that UConn Engineering has undergone in recent years, especially under the watch of Engineering Dean Kazem Kazerounian. 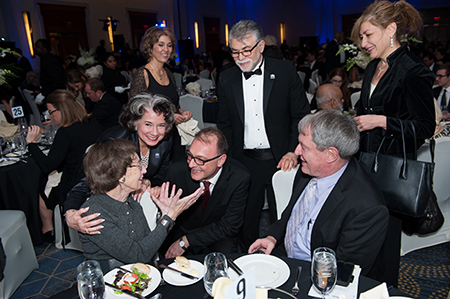 “During Kazem’s time as dean he increased enrollment in four years by 110 percent. He hired more than 50 outstanding professors with an emphasis on women and underrepresented minorities. 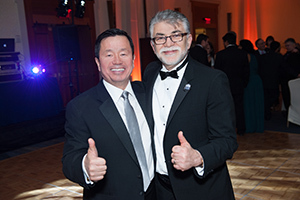 He increased research awards to $60 million, three times more than it was 10 years ago, despite reductions in overall spending on federal research,” Choi said. Kazerounian discussed the tight bond that exists within engineering, calling everyone assembled a member of a family. “Today is practically a family birthday,” he said. Kazerounian also emphasized how important increasing the population of women students is to UConn Engineering. He referred to the recent story about UConn Engineering closing the gender gap at a faster rate than other public universities. To emphasize how far UConn has come in welcoming women into engineering, a video tribute of Tina Lewis played. Lewis was one of the first two women to attend UConn Engineering, graduating in 1955. In the video, Lewis talks about getting her first engineering texts and being told they were boy’s books. “I smiled and said ‘no, they’re engineering books, they’re not boy’s books,’” Lewis said in the video. 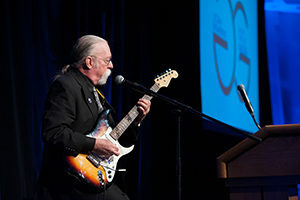 Jeff Baxter, a founding member of Steely Dan and a former member of the Doobie Brothers, was the featured speaker of the night. Baxter, who is now a defense contractor, spoke about the ways engineering and music overlap. He talked about breaking down songs in a similar way to how engineers might evaluate a structure, and the imagination and creativity that can help a person excel in either arena. To see a gallery of pictures from the event, visit our Flickr site.